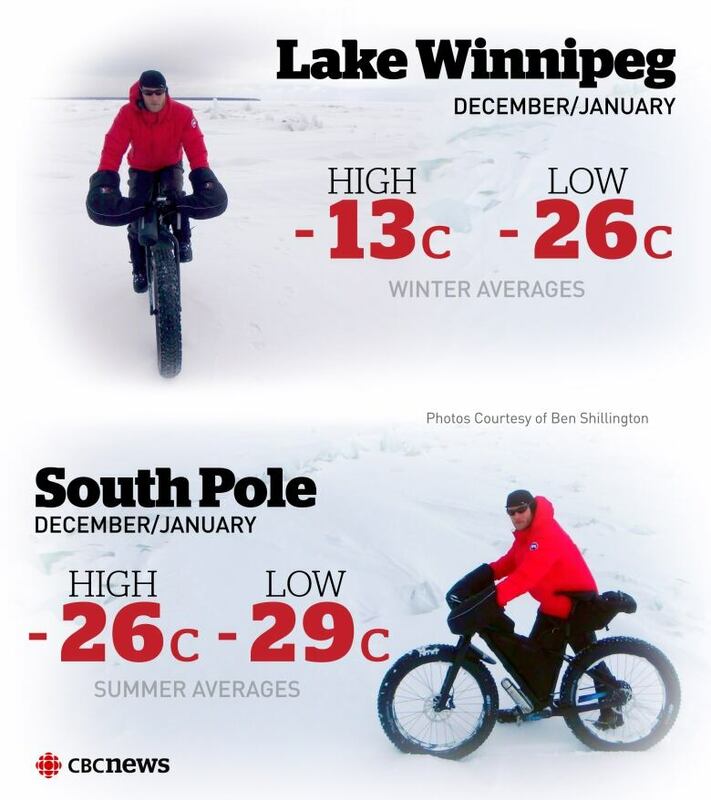 A brave group of cyclists is peddalling out onto the icy surface of Manitoba's largest lake to ride the burliest bikes on the market through blistering winds and blowing snow, all in preparation for a trip across the South Pole. Two guides with TDA Global Cycling will accompany 10 riders from around the world on a three-day trip across Lake Winnipeg that officially starts Friday. The ride will serve as a training session designed to introduce the winter cyclists to some of the harshest riding conditions on the planet before they head on the world's first fat bike expedition to the South Pole next winter, dubbed "The Last Degree." "The concept of this is basically to bring people out in the winter time and give them the skills necessary to thrive multiple days in a row," trip leader Ben Shillington says. Organizers spent last weekend in the Hecla Island area, 170 kilometres north of Winnipeg, scouting trails and conditions on Lake Winnipeg. The group came together Tuesday before heading north into Manitoba's Interlake region for the excursion. After spending a day indoors overnight, the cyclists ventured out to learn how to set up and take down a tent on the ice. Each cyclist will carry a shovel, tent, camp stove, food and other items on them for the extent of the training and South Pole trip. "They're going to get an opportunity to ride around fully loaded, and see what it's like to layer those clothes and how warm you actually are once you start cycling," Shillington says. While the focus of the big trip next winter is ultimately about having fun riding bikes in a new environment, there is also the rather serious challenge of keeping warm, well-fed and hydrated throughout. "The temperatures there, in the travelling season for Antarctica, get down to – 35 C, – 40 C, and then you can throw some windchill on that — and that's why Lake Winnipeg lends itself well," Shillington says. But those are just worst-case scenarios. In the dead of winter, CBC meteorologist John Sauder says average overnight lows on Lake Winnipeg are in the – 26 C range. In the South Pole, he says December through February (summertime or "travelling season" in Antarctica) see the mercury drop to –29.6 C on average at night, assuming there's no wind chill. Out on Lake Winnipeg Thursday, cyclists were given a crash course on how to change flat tires fast and efficiently without losing fingers to frostbite; how to start and keep a camp fire lit in the middle of a frozen desert landscape. Organizers put participants through a "systems check" routine, going over packing lists to ensure they all had the appropriate specialized equipment necessary to stay alive in the middle of the South Pole — or Lake Winnipeg, which Shillington calls a "model" simulation environment. Organizers also chose Lake Winnipeg to be the site of the training course because it's easy to access and shares a few uncanny similarities with Antarctica. "You can get to a point where there's no visual land reference," Shillington said, adding cyclists will cover between 110 and 120 kilometres of snowy territory in 18 days on their South Pole trip. "[You] get basically a pretty perfect simulation of what we'd be encountering down there." Shillington isn't a complete stranger to Lake Winnipeg. He trekked along the north basin through a cold snap a few years ago and is hoping for similarly harsh conditions for his clients. "That was just really good preparation and that's what I want to re-simulate again with our clients so they know what to expect," he said. The course is mandatory for everyone signed up to go on the South Pole expedition. Shillington said it was important participants get a positive experience on a landscape like Lake Winnipeg under their belt before heading south. But, he says, the training session could also give riders pause and a chance to duck out of the big expedition before it's too late. "You want to make sure people don't sign up for something that they don't understand they're getting themselves into," he said. In the end, the fat bike South Pole trip and Lake Winnipeg training session are about having a good time, facing a new challenge and staying active outdoors year round, Shillington added. "It's essentially a new way to go explore."